What are YOUR favorite eBook sites? My first thoughts: This is great! Second thoughts: These websites don’t seem to have many children’s books…and who actually uses these sites? Why have I never heard of these sites? As an Indie self-publisher, I fall into one category, but as a children’s author I fall into another way out in center field category. I think most eBook websites are for the adult avid reader who devours every indie book that comes along…but those books aren’t often for children. Nonetheless Smashwords thinks my books are worth passing around the web. So do YOU use Bilio, Oyster or Scribd? Do YOU get your children’s ebook from any of these sites? Pink’s Garden Book #7 Now Free! Discover the color pink with your preschooler in 25 real photos taken by the author. Featuring Nepal’s Elina the elephant too! It’s now free on Amazon.com (hit the link above) until April 23. Please share, share, share! And leave a review if you toddler/preschooler enjoyed it! As a newbie to Listmania, I am glad to share my first ebook list. Our life really does revolves around kids ebooks and since making lists are so much fun, I think there will be more loss made soon!!! Join our family’s best preschool ebook reads and have fun! After months of procrastination, Pink is here and ready for you to visit her garden! Only .99 cents for this lovely visit through Pink’s flower garden. 25 real life photos taken from around the world by the author are welcoming and enjoyable. Check it out today! Pink’s Garden is book #7 in the My Color Friends Book Series! Animals, Countries, Continents, and More! Educational picture book galore by Becky Wolff, most are currently FREE! Just one of several lucky finds his morning! Time for a game of I Spy! It’s everyone’s favorite car game–I Spy! Come play I Spy through great Grandma’s garden, it is now in an ebook for you! I Spy…Purple is a fun and interactive ebook game for your family! Now available at Amazon.com for only $1.99. My friend Purple! Play a fun game of I Spy with your little one to discover purple in real life photos starting in Colorado then going to the nations! 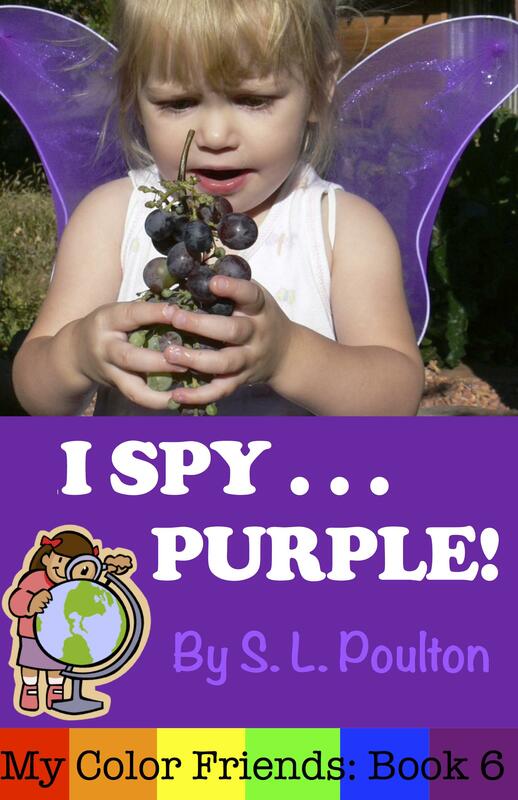 I Spy…Purple is book number 6 in the My Color Friends educational book series. At MCF weare celebrating another self-published book. We will work on getting it to print and in other eBook formats as soon as we can!